French woman painter. Constance Mayer s name is closely associated with that of Pierre-Paul Prud hon, with whom she collaborated on many works often catalogued under his name. She was one of an increasing number of women artists who worked mainly as painters of miniatures, portraits and genre scenes. In the middle years of her career, under the impact of Prud hon s influence, she turned to allegorical subjects. She studied first under Joseph-Benoît Suve and then Jean-Baptiste Greuze, whose sentimental subjects and soft handling left a deep and lasting impression on her work, but especially on the early Salon exhibition pictures of children and young girls. It was as a pupil of Suve and Greuze that she signed her Salon submission of 1801, Portrait of the Artist with her Father; He Points to a Bust of Raphael (Hartford, CT, Wadsworth Atheneum), although that year she took lessons from Jacques-Louis David. His teaching accounts for the greater clarity, incisiveness and serious tone of the work. Despite the bust of Raphael and antique fragments on the studio wall in this painting, Mayer never really incorporated these models into her own work and remained closer in subject and sentiment to Greuze than to David. She had a long and happy relationship with her master Pierre-Paul Prud hon which ended with her suicide in 1821. 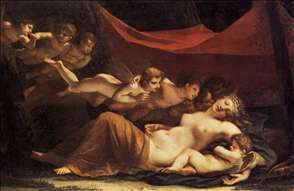 See more details about "The Sleep of Venus and Cupid"